In a large saucepan, combine rice and water. Bring to a boil, cover, reduce heat and simmer for 45-60 minutes, until grains have started to pop. Remove from heat with lid still on and allow to stand for 30-60 minutes until desired texture is achieved. Drain and cool. In a large bowl, combine rice, celery, cucumber and green onion. Prepare dressing: Whisk well or use blender to combine ¼ cup (50 mL) of the blackberries, red wine vinegar, canola oil, sugar and pepper. 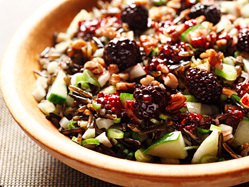 When ready to serve, in a large bowl or individual plates, place rice mixture on bottom, sprinkle with remaining ¼ cup (50 mL) blackberries, pecans and drizzle attractively with dressing. Prep Time: 15 min. Cook Time: 60 min. Makes: 6 servings Source: www.heartandstroke.com (recipe developed by Emily Richards, PH Ec. ).